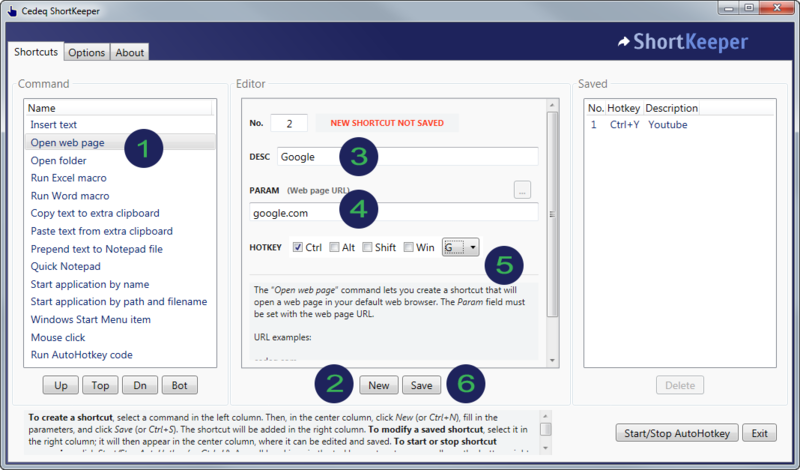 In the left column, select the command “Open web page”. Note: The order of commands in the list can change. The Up/Top/Dn/Bot buttons at the bottom of the list let you move up your most useful command(s). In the center column, click the button New. Note: If you don’t click New you will be editing the selected shortcut in the right column instead of creating a new one. In the DESC field (center column), type “Google”. In the PARAM field, type “google.com”. In the HOTKEY section, click Ctrl and select G.
Note: Selecting any other item in the Saved column, hitting Esc, or clicking the New button will discard any unsaved changes. That's it! Pressing Ctrl+G will launch Google with your default web browser (if AutoHotkey is running). If AutoHotkey is not running, just start it with the Start/Stop AutoHotkey button. It is possible to set an option (in the “Option” tab) to start AutoHotkey automatically at Windows start-up. There is also an option to start AutoHotkey automatically when ShortKeeper starts. A small hand icon in the system tray, usually at the bottom right of the screen, will indicate that AutoHotkey is active.